I like trying new things. By “things” I mean food. Living in Austin means I get an ever evolving restaurant scene in which to bask in beautiful tasty goodness. This past weekend I ventured to the North Austin Trailer Yard, NATY. Some bites were simple meh, but one place was amazing. This trailer yard is right outside my gym, which is…unfortunate. It makes circuit training much less effective. But that’s mostly due to the good food found within. 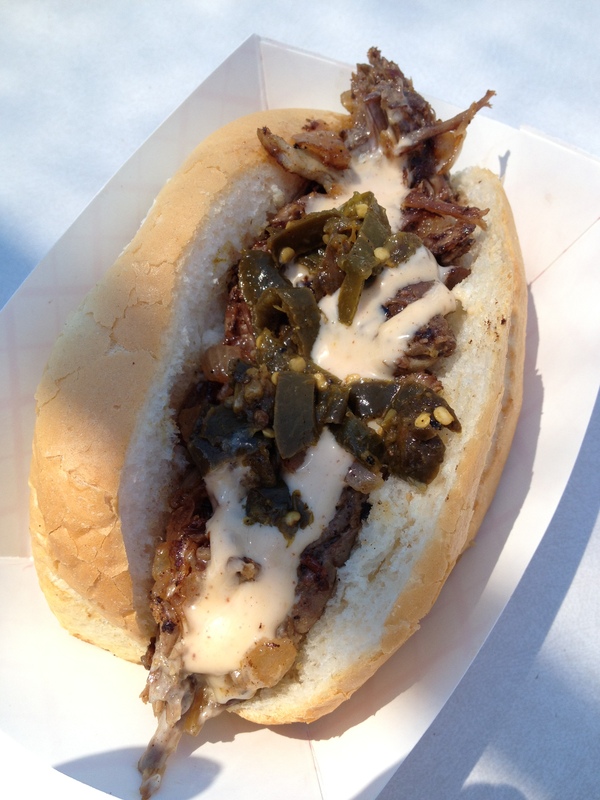 On Saturday we ordered a beef Snarky cheese steak from Boo Bawk Oink and a Black and White Donut from Krak 2 which is within the same trailer as Moo Bawk Oink and a bottle of water. The entire tab came to $13, which we considered to be a bit pricey for trailer food. The sandwich was overly bready and the meat what I believe to be pulled brisket, in fact at first I questioned if it was pork, a little dry, but not bad. I prefer the horrible cheesesteak sliced meat, but it was a decent sandwich. The jalapenos are not spicy and the cheese more like white goo sauce. Good enough to try, not sure if I’d go back, especially considering its competition at NATY. We also ordered a bowl of ramen from Michi Ramen. Michi Ramen is, in a word, AMAZING. Flavor, rich, warm, traditional, the comfort food you never knew your craved. Michi only has the room to create 50 bowls of Ramen for lunch and 50 for dinner, so their twitter is merely a count down of the bowls they have left. At noon on a Saturday, however, Chip and I had no problem scoring a bowl. The line was steady, though, and for good reason: As an American who thinks of ramen as those dried 38cent packets you can get at the grocery store. What Michi serves is incredible, flavorful, and even served with a poached egg if so desired. The broth is cooked for almost TWO DAYS with all natural ingredients (this is their claim, but boy does it taste like it! ), pork bones, leaking their delicious marrow and flavors into a rich base for a ultra flavorful lunch/dinner. The standard ramen is served with two slices of Cashu on top, gorgeous, fatty, soy marinated braised pork. It was $9, but in this case it was money well spent. I took home our left over broth, let it coagulate and then sauteed spinach in it with the next night’s dinner of grilled steak and mashed cauliflower. 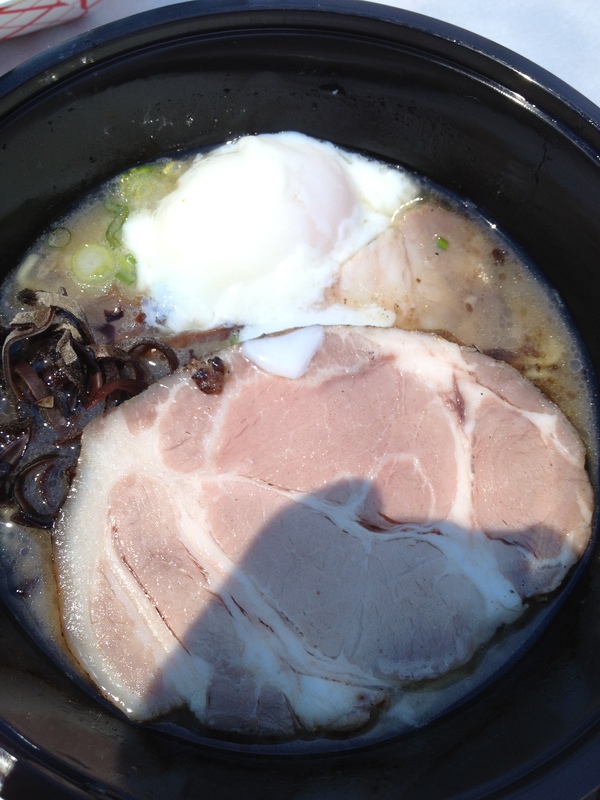 Yes, under the pork and poached egg and mushrooms there are ramen noodles. 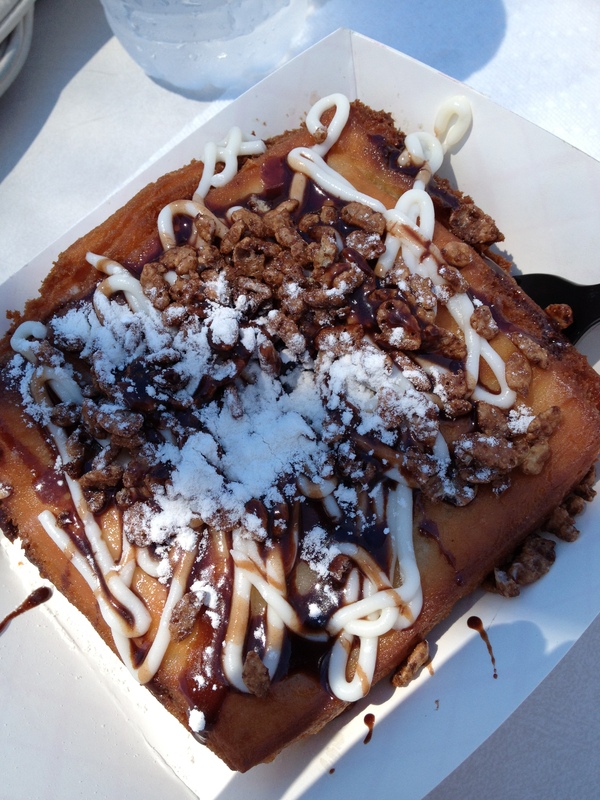 This entry was posted in Entertainment, Food, Humor and tagged austin, dessert, diet, donuts, eat, food, food truck, foodie, krak 2, lunch, michi ramen, moo bawk oink, NATY, north austin trailer park, recipe, restaurant, trailer.